Neary 130 Years has passed by since our founder Mr.Eiichiro Ueyama met Mr.H.E.Amoore, a plant trader in USA, and obtained seeds of Pyrethrum flowers in 1885(Meiji 18). Since then we have been contributing to betterments of healthy and comfortable living environment by developing epoch-making new products such as the invention of Spiral type Mosquito Coils, etc. Pyrethrum flower is the starting point of KINCHO's long-lasting history. The origin of Pyrethrum flowers is Yugoslavia(current Serbia) and its insecticidal efficacy is said to have been found in 14th - 15th century. A woman picked Pyrethrum flowers in the field and brought them back to her room. Several days later she found many insects died around the withered flowers. R&D of insecticidal efficacy of Pyrethrum flowers started then. Pyrethrum flowers were brought to USA during 17th - early 18th century, then to Mr. Eiichiro Ueyama in Japan in the end of 19th century. 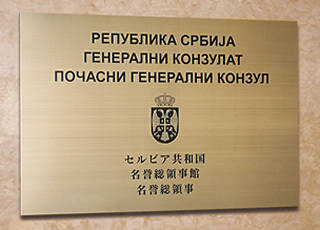 It was the beginning of the close ties between Republic of Serbia and KINCHO. 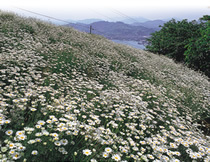 Kincho maintains a memorial Pyrethrum flowers field on the south slope of ONOMICHI CITY MUSEUM OF ART with cooperation of the local government since 1980. The cultivation of Pyrethrum flowers in Japan successfully spread and the full-scale export of Pyrethrum powder started first in 1905(Meiji 38). In those days Pyrethrum powder was indispensable to control harmful insects as there was no other alternative then. with Pyrethrum extract oil, etc. In 1920s Japan caught up with Yugoslavia in export volume of Pyrethrum powder, and in 1930s became the biggest export country in the world. 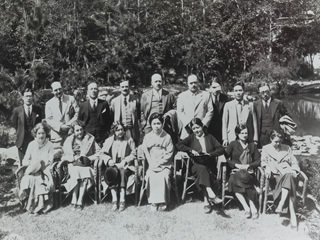 In 1929(Showa 4), the King Aleksandar I Karadjordjevic of the Kingdom of Yugoslavia honored Mr. Eiichiro Ueyama with the title of Honorary Consul of the Kingdom of Yugoslavia in Osaka for appreciation of his contribution to develop more productive cultivation methods and useful applications of Pyrethrum flowers. 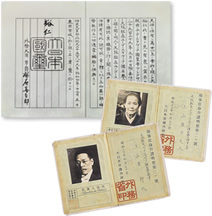 In the following 1930(Showa 5) Mr. Kantaro Ueyama, Eiichiro’s son, was also appointed Honorary Vice-Consul of the Kingdom of Yugoslavia in Osaka. 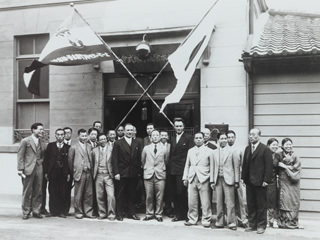 In 1936(Showa 11) the King Aleksandar I Karadjordjevic of the Kingdom of Yugoslavia honored Mr. Eiichiro Ueyama with CONMANDOR SANSABA medal. This hanging bell was presented by consular group in Osaka of 5 countries, United Kingdom, Germany, Finland, Sweden, and Czechoslovakia, in celebration of this award when they visited his villa in Shirahama, Wakayama Prefecture. 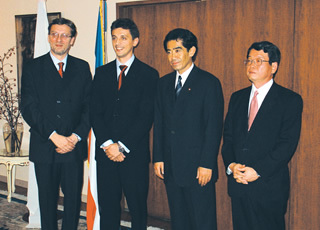 Although Yugoslavia was the first to have reinstated diplomatic relations with Japan among Eastern European countries after the World WarII, the friendly relationship between Yugoslavia and KINCHO had taken time to revive. 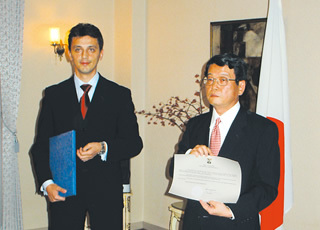 After the state union of Serbia and Montenegro was born, Mr.Naohide Ueyama was appointed Honorary Consul General of Serbia and Montenegro(now Serbia) in Osaka in hope of further development of friendly relations between Serbia and Japan. 2006 The Republic of Serbia became an independent nation after ending their alliance with Montenegro. 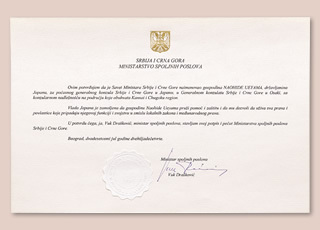 President Naohide Ueyama was appointed as Honorary Consulate General of the Republic of Serbia in Osaka following on from the founder, Mr.Eiichiro Ueyama. Located inside Dainihon Jochugiku Co., Ltd. Copyright © DAINIHON JOCHUGIKU Co.,Ltd. All rights reserved.